It's always exciting to be part of something from the very beginning, but then to be the winner of the first prize--WOW-WOW! Bah! Humbug! 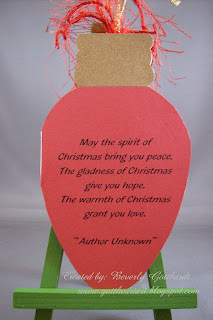 has a great challenge site for fun and you end up with lots of Christmas cards, tags, and projects so you're not scrambling at the last minute in December. Wouldn't that be a novel happening? Bah! Humbug! Challenge 3-All That Glitters! Supplies: Ivory card blank 4" X 5 1/2" Halcraft, Christmas light bulb template-Stamp Asylum, Papers: from my paper stash, Glitter-P.K. 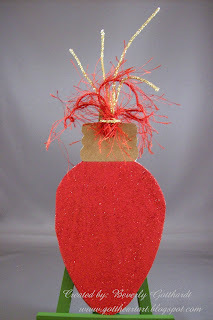 Glitz "Twilight" China Red, Sentiment generated in Printmaster 11, eyelash yarn and gold cord-$ Store. oh never thought of this Beverly - so clever and it would be great for tags as well as cards. Yeah super cool idea - love it. Thanks for joining us again at Bah! Humbug! and also your kind words. You're a star. What a fantastic idea, like Ann never though of it. Gorgeous colour with a great verse. Love it. Thank you for joining us again at Bah!Humbug.